Volos (326 km. from Athens, 215 km. from Thessaloniki) is the capital and economic centre of the prefecture. Thanks to its privileged position at the foot of Mt. Pelion on the Pagasitic gulf, it is a good base for enjoying the sea, wooded slopes, and green valleys that surround it. As for the derivation of the word "Volos", which according to a Byzantine historian of the 14th century was called "Golos", there are several theories; the most widely accepted is that it represents a corruption of the Mycenaean Iolkos. Founded in the mid 19th century, modern Volos, with 71,000 inhabitants, is a cheerful , lively town, soundly laid out with pleasant broad streets. The waterfront is an ideal spot for a stroll. A modern coastal avenue bustling with life, it is lined with pastry shops, cafes and restaurants. From the suburb of Ano Volos, built upon the slopes of Pelion, the Pagasitic gulf and the town below take on another dimension. Volos harbour is particularly active. It is the main export centre of Thessaly and the scene of much commercial and passenger traffic bound for the Sporades, the great ports of the Mediterranean, Syria, and other Middle Eastern cities. The Volos Archaelogical Museum (tel. : (0421)28.563): contains a rich store of finds from the Bronze Age, pottery of the 8th and 5th century BC, and 6th and 5th century sculpture. For example, its collection of Hellenistic grave stelai from Dimitrias is unique; their well preserved paintings are considered among the most important examples of ancient Greek art. Municipal Gallery (tel. :(0421) 25.760): Housed in the Town Hall, it comprises a fine collection of paintings, sculpture, and engravings by modern Greek artists. Home of the folk historian Kitsos Makris (tel. :(0421) 23.778) with works by Theophilos, Christopoulos, Byzantine icons, wood carvings and pottery. Pelion old fashioned train: This little train which used to connect Volos with Milies has been put back into service over a short portion of the old urban line. It would be running on special occasions. The churches of Agios Konstantinos, Agios Nikolaos, Metamorphosis and the chapel of Agia Triada. At Anakasia, the Theophilos Museum with frescoes by the great folk artist. At Alli Meria, the Velentza bakery with wall paintings by Theophilos. The lush area around Volos is scattered with interesting archaeological sites which history buffs will find very rewarding, while the summer resorts bordering beautiful beaches abound in picturesque tavernas offering local delicacies. The azure sea is ideal for bathing. Taking the Volos - Larissa National Road, a small detour will lead you to one or more of the various archaelogical sites in the vicinity: the prehistoric settlement of Dimini (6.5 km) with a ruined acropolis, walls and two beehive tombs dated between 4000 - 1200 BC; Sesklo (13.5 km) with the remains of the oldest acropolis in Greece (6000 BC), as well as the foundations of a palace and mansions among the most typical examples of neolithic civilisation. A bit further to the west lies the village of Velestino (17 km) birthpace of the revolutionary poet Rigas Ferraios, built on the site of the ancient city of Pherai. Near the coast road heading southwest of Volos, you will spot a pine wooded area containing the ruins of ancient Dimitrias (4 km), the important city founded by Dimitris Poliorkitis in the 3rd century BC. In this particularly extensive archaelogical site there are ruins of a temple, palace, and theatre with incomparable acoustics. Portions of the city circuit wall can be seen on a hill to the right of the road. The famous grave stelai adorning the Archaeological Museum in Volos were discovered in the towers still standing on the acropolis. A little to the east, at Pefkakia, are the scant remains of a Mycenaean settlement identified as the Homeric city of Neleia. The road then passes by Nees Pagases (5 km), today a summer resort with good facilities for tourists built on the site of ancient Pagasai, an eminent commercial centre of the 5th century BC, and port of ancient Pherai. Maratho (13 km) and Chrysi Akti (15 km) further south are renowned for their crystalline waters and the fresh fish served in their tavernas. The main road continues along the shore, passing Nea Anhialo (18 km), a pleasant market town built in a fertile region in a position formerly occupied by Ancient Pyrrasos, which together with the neighbouring city of Phthiotic Thebes was the most important commercial centre on the Pagasitic gulf. Its little museum contains neolithic and early Christian finds. Continuing on you come to Mikrothives (25 km) which took its name from Pthiotic Thebes. There are ruins of the old city - walls, temple, theatre and a stoa - on the nearby hill. At Almiros (35 km), the centre for animal husbandry and farming in the area, you can visit the Archaelogical Museum, while the Kouri park, the ruins of Ancient Alos and the monastery of the Panagia Xenia at Orthris are other sites in the vicinity worth investigating. The seaside village of Amaliapolis (57 km) near Cape Almiros is a very popular holiday spot. 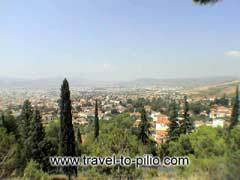 One of the largest villages in the Almiros area is Sourpi, surrounded by bountiful olive groves. Its taverns serve delicious "kokoretsi", a treat made of liver and lights, spit-roasted on glowing coals. As you proceed along the coast road, which cuts through the southern section of Magnesia past extraordinarily picturesque scenery, it is worth stopping at Pteleos (60 km), a historic village with more olive groves, and at its port, Pigadi, a quiet fishing hamlet with sparkling waters and an abundance of fresh fish; at Ahilio (67 km) , an idyllic bay with a long beach, and an ideal sanctuary from the August heat; and Agios Dimitrios, a village on the Malliac gulf bordered by golden beaches. Finally the village of Kanalia (26 km) surrounded by almond trees is well worth a visit. Every March there is an almond bossom festival. Here also there is a thriving bronze handicraft industry.